JUNGLE: Which teachers, artists, or movements helped form or change your perspectives about typography and typographic design? JEAN-FRANÇOIS PORCHEZ: I discovered typeface design through Calligraphy during my first year of graphic courses with my teacher of calligraphy Ronan Le Henaff, who himself at this time was learning type design at Atelier national de Création Typographique (National Workshop for Type Design, abbr. ANCT). For the next two years, I continued to explore type design with other students from ANCT (who were also teachers in my school!). 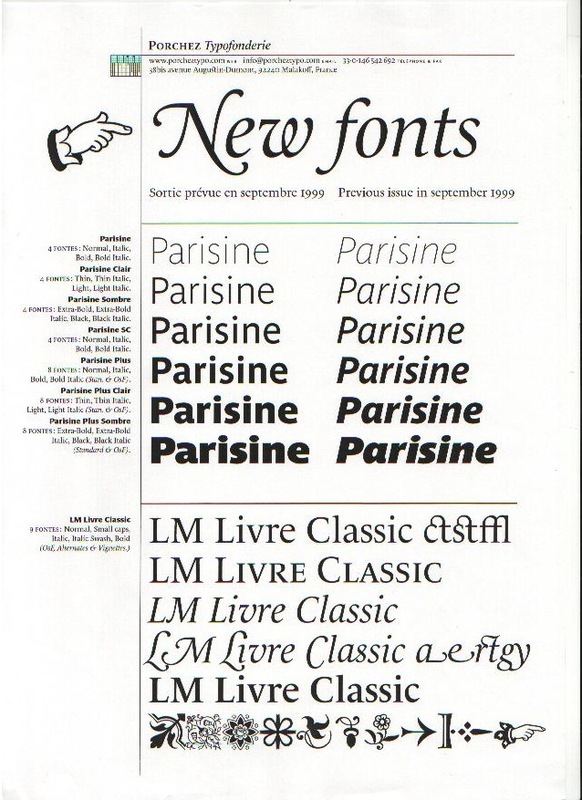 Jean-François Porchez won the First Prize at Morisara International Typography Award with typeface Angie in 1990. During the last year at ANCT, I decided to start creating a set of complete typeface to understand all aspect of the design: now FF Angie. During theses years, I was commissioned by several packaging and corporate identity agencies to do some lettering and logotype work. I also discovered Bernard Arin, who was leading and teaching at the Scriptorium de Toulouse from 1968. He opened my mind about type design, that it has to be rooted in scriptures and calligraphy studies. 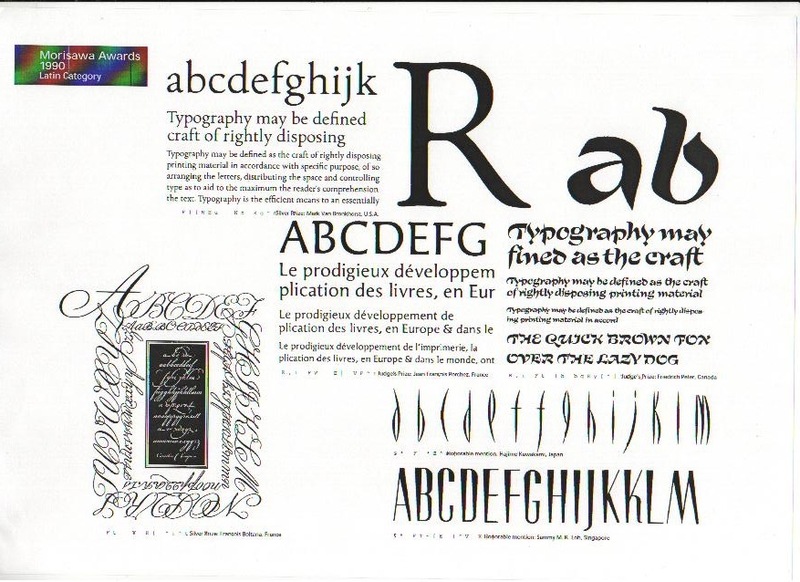 Calligraphy became my initial reference when I started first designing typefaces. But quickly, I understood that books can provide much more information and resources for “self-teaching” than actual teachers. Books were instruments to find my own personal way. I discovered that the books of typographic history were mainly written in English, so I started to learn English by reading books on typefaces! In those years, there was no real equivalent in French. The situation has changed now. My references are mainly from books. As I remember, Twentieth Century Type Designers by Sebastian Carter, Anatomy of Typeface by Alexander Lanson, Hermann Zapf and His Design Philosophy by Zapf himself, and Letters of Credit by Walter Tracy gave all my first understanding of my future job. By the time when I have been accepted to ANCT (which changed its direction the same year), I considered myself that I already knew about type design. My winning of the first prize for the typeface proposed to Morisawa Awards before ANCT proved that. This special one year at this school was only to reaffirm my determination: I’m going to be an type designer! JUNGLE: As a French designer, how much do you value and treasure the history and tradition of French typography? And how are your ideas reflected in your design? What, in your opinion, is the most essential element in typographic design? JFP: The Rencontres internationales de Lure (French equivalent of ATypI created in the fifties by Maximilien Vox, creator of Vox-ATypI typeface classification) is the main link to French type tradition. People like Gérard Blanchard (died last year) showed me “my” French roots. We discussed many times about type history and contemporary type design. In France, there is a big generational gap between young and old type designers. There is nobody from the same generation of people like Erik Spiekermann or Sumner Stone. But the Rencontres internationales de lure helped me to meet and discuss with people like Ladislas Mandel and René Ponot, who by their knowledge opened my mind to French tradition and viewpoints that I understand very well, because I compared their vision to the Anglo-Saxon typographic philosophy. Each country has its own culture, regarding typefaces. I strongly think that the typeforms can’t be the same in all countries, first because our languages are structurally different and a type designer “dreams” his new typefaces in his own language! Natural rhythm in German texts is really more contrasted than Latin or French. For example, German designers like Zapf or Spiekermann naturally designed more structured, straight, square and low-width contrasted forms of letters. In reverse, I design a text typeface more contrasted in forms widths to give more life to my texts to balance the low contrasted French text language. JUNGLE: Have your perspectives about typography changed during your professional career? For instance, your perspectives as a student, as a career-launching young designer, and as an established designer as now? If so, how? JFP: I don’t think so. It’s a too long a process to design fonts. JUNGLE: How many new typefaces are turned out (or released) at which frequency? And tell us about your workshop Typofonderie? JFP: I don’t know! I currently work on two families for clients and two for my own. The first was the extension of the Parisine that I design in 1995/96 for the Paris Métro signages to optimize legibility and economy of space, in bold and bold italic at this time. I was asked to create an 12 series families (6 romans and 6 italics). I will probably finish it next month. The second was a family more distinctive in term of style, designed for Costa Croicières, a large Italian company specializing in boat trips and selling holidays mainly via catalogues printed in many different languages. The new family fonts are more distinctive and unique compared to their concurrents. It’s a 4-series family from Light to Bold. I am also trying to complete a new part of Le Monde family called Le Monde Livre Classic, which features alternative forms for many letters of the original Le Monde Livre. This new family is designed to give more historical roots to composed text, as I will provide many ligatures, alternates and ornaments. The Italic is declined in two variations from Standard Italic (but more flowery than the LM Livre original) to Swash version. Lastly, in parallel to Parisine family, I am developing a Parisine Plus which features more original forms and alternates in the same way as Le Monde Livre Classic. Also very different from Parisine is an San-serif typeface family. JUNGLE: When you work with clients – as they usually look for a tailored and exclusive appearance in the typefaces, how do you approach and convince them? Could you give us an example from your former or present clients. JFP: Because I have been teaching since a long time, I understand very well that it’s important to explain many aspect of work to future clients. 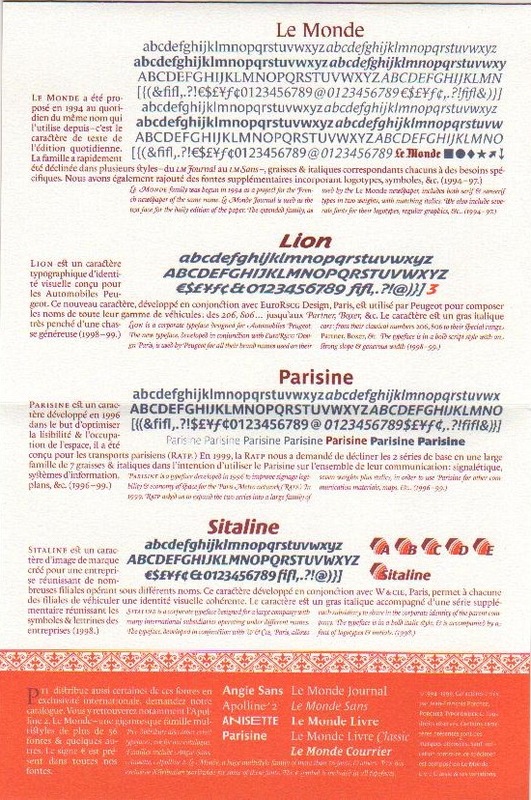 For example, I contacted Le Monde newspaper to propose an exclusive typeface that they never asked. I voluntarily offered my presentation of my new typefaces. After only few weeks of discussions, they decide to buy it! Because they understood how a carefully adapted typeface can optimize legibility and provide them with a strong typographical identity. The newspaper increased in sales after that, but not only because of the new typeface but also the new layout of the newspaper. 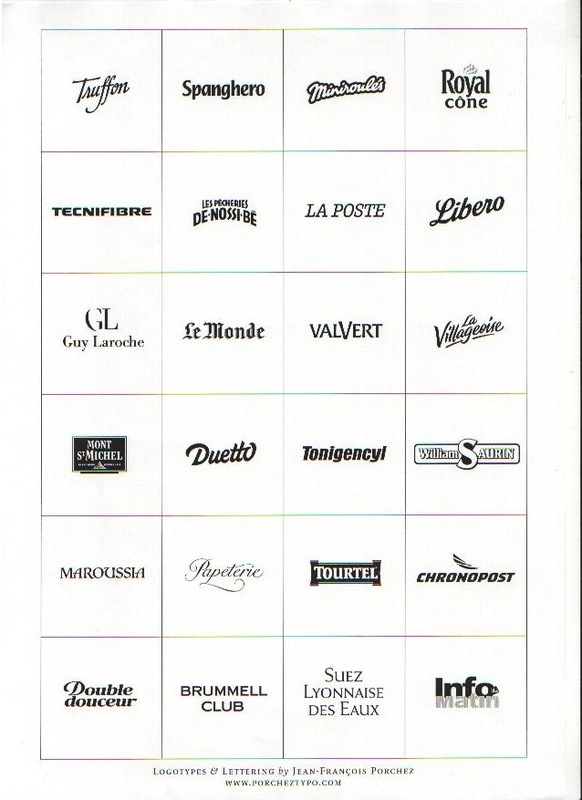 I was very proud of that, as Le Monde is actually the only French newspaper that uses a custom typeface family in France. JUNGLE: You obviously contribute actively to teaching as well as publications both in journals and books in the field of typographic design. What are the topics of your lectures and courses, and what are your aims in teaching? JFP: I always think that parallel typographical activities gives good opportunities to better understand my work. I contribute to associations like ATypI, for an improvement of typography in general. Last year I published Lettres Franacises, a specimen of all French contemporary digital typefaces to promote the French typography throughout the world. This book, published in French/English, includes some essays by Gérard Unger (outside view), Gérard Blanchard (inside view) and several texts on French typographical schools, list of most typefaces created from the beginning of this century, etc.. I wrote from a couple of years many articles on contemporary international type designers such as Matthew Carter, David Berlow’ Font Bureau, Gérard Unger, LettError, Carol Twombly, etc for French graphic design magazine Étapes and several articles, essays for ATypI Type Journal and related publications. I also organized type events in France like the last ATypI conference MultiTypo 98, where 500 people came from all over the world to attend more than 28 lectures, exhibits, group discussions, visits, and etc. 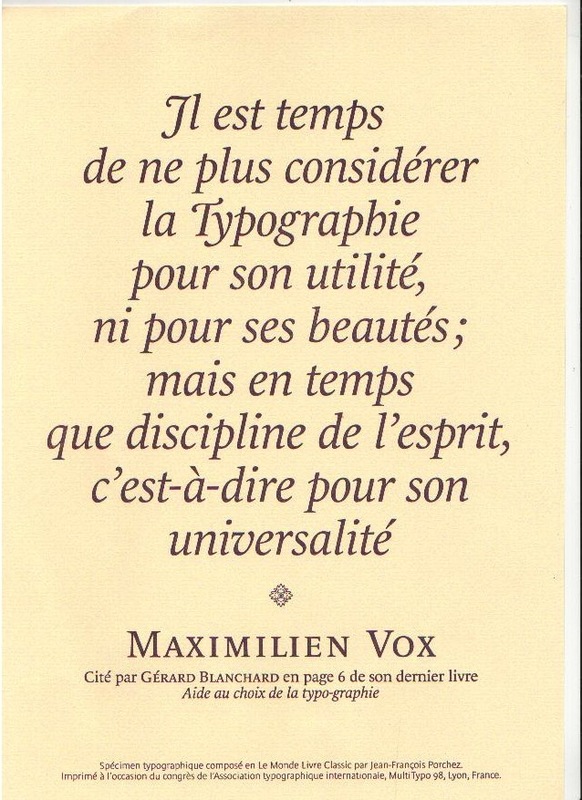 Yes, I taught typography from my first year of activity in several Parisian schools, now I keep only an high level Type design course at École Nationale des Arts Décoratifs in Paris. JUNGLE: What is your latest interest or fascination in terms of your source of inspiration for the new typeface design? JFP: I learned to design typefaces on paper, but quickly, like many graphic designers, I moved to computer design. Now, I design my typefaces directly on screen from scratch with Burmerster curves. But when I need to more wrote forms, I scan some roughs or calligraphies to provide me with better sources. Sometimes, it is quicker to draw letters in small sizes (less than 2 centimeters high caps) on papers than directly on the screen. I don’t what to be software-dependent, when software can offer what I ask. I change it for another or work on paper! I started in the early nineties with URW Ikarus specialized software for digitization of paper forms. After that I worked on Macromedia Fontographer, sometimes with Illustrator. Now it’s a mix of Fontographer, Robofog and FontLab and some small Apple and Microsoft softwares for very specialized fine-tuning. I like the philosophy of Robofog more and more, because this software is created by LettError and other Dutch typography designers for type designers! The concept is that you use script written in Python language to create and produce your fonts, so the software has no limits anymore. All the users are at all times in interaction with the developers by mailing lists. When we ask for a new function that we can’t do by our own scripts, they update Robofog very easily and quickly for us. The computer tools have no direct influence on my forms; my influences come from my readings, most of the time historical. Latin type forms have already 2,000 years of history, so when you know past very well, you know what you can do or not when you design new fonts. I adapt my forms to current technology rather than the the other way around! JUNGLE: Finally, we come to the last question to wrap up. What is your view about non-Roman alphabetical fonts? Are there any particular foreign letter forms other than Roman alphabets which interests you? Monde Cyrillic. My Grand Mother was Russian origin! * This interview originally appeared in Magazine Jungle in Korean posted September 16th, 1999. See also article here.